Organisational culture and behaviour rests on the prevailing climate that exists in the firm. This climate can encourage resilience to appear in an organisation, or it can in fact encourage a set of circumstances where the organisation breaks at the first sign of crisis. Studies have shown common characteristics of “resilient” organisations, or organisations that have stood the test of time in the way they are managed, successful corporations and those that have “kicked in” the extra mile to out-strip competitors. In particular, Tom Peters’ work in “In Search of Excellence” (1979) and his later book “Thriving on Chaos” (1987) and Jim Collins’ work in “Good to Great” (2001) have identified characteristics of such successful companies. Having identified the characteristics of organisational resilience, the process of creating a corporate culture that builds in resilience is part of a change management process. The “guru” of change management is Professor John Kotter of Harvard Business School, and in his 1996 book “Leading Change” Professor Kotter summarised his study of international large scale change efforts. Having studied successful and unsuccessful change efforts, Professor Kotter isolated 8 mandatory steps that any successful change initiative must follow. In order to create a sense of urgency an honest SWOT analysis is a solid first step to confront the brutal facts. The negative side of the equation starts to build up as against the positive, because mentally, everyone is there to “improve the situation”. A SWOT analysis needs to be conducted with far more balance, thought and care. A SWOT analysis should be started some time before the planning day and then brainstormed from those previous considerations at the planning day. 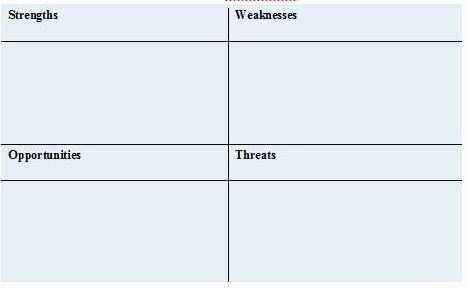 Firstly the best way to explain the difference between Strengths v Opportunities, and Weaknesses v Threats (and they are never a bit of both!) is to categorise Strengths and Weaknesses as internal positions and Opportunities and Threats as external forces. Strengths and weaknesses exist within the organisation because of the way the organisation is structured, managed, operated, and so on, whereas opportunities and threats are pressures put upon the organisation by outside forces. And the reason why they are never “a bit of both” is that while a strength may look like an opportunity, it only does so because it is a strength and you can make much of it (hence it looks like an opportunity. 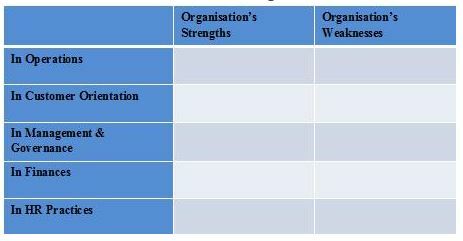 A model to use to properly analyse SWOT is to break the “SW” from the “OT” by using three tables. In this table, you examine in turn 5 internal sets of focal points being Operations, Customer Orientation, Management & Governance, Finances and HR Practices. Whilst focusing on one at a time you consider the organisation’s strengths and weaknesses, thereby categorising strengths and weaknesses in specific areas of the organisation’s begaviour. Having identified the characteristics of a resilient organisation and examined Professor John Kotter’s 8 steps of successful change management and how these 8 steps can be used to transform your organisation into a resilient organisation, what are the implications for Leaders? Firstly, the most important implication is the need for a Leadership mind-set. 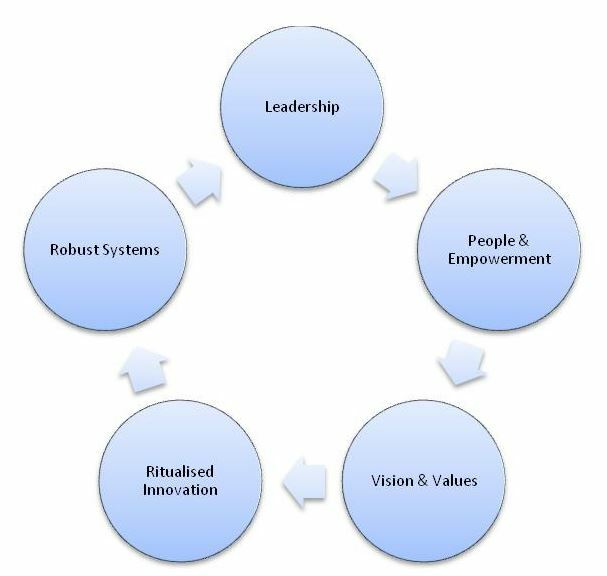 Whilst the business of management is still important and has to be balanced with the qualities of leadership, nevertheless all the case studies have shown that a transformation is not possible without strong Leaders in the organisation. Assuming the Leadership mind-set exists in your organisation , then what do Leaders need to do to transform the organisation into a resilient organisation? Communication, communication, communication: Leaders need to ensure they have the skills to communicate well, fully, and with conviction about the need for change, the urgency, the change vision and the strategy. This is imperative; put time aside in a disciplined manner; you need to lead the way forward not push it through. Communication needs to be constant and use all types of vehicles. Leadership communication is not about an article a month in the company newsletter, it is about using every opportunity to speak about change, discuss change, and champion change. Management· Planning & budgeting: establishing detailed steps and timetables to achieve results, then allocating resources to make it happen. · Organising & staffing: establish structure for accomplishing plan requirements, staffing that structure with individuals, delegating responsibility and authority, providing policies and guidelines and creating methods and systems to monitor implementation. · Controlling & problem solving: monitoring results, identify deviances, then planning and organising to solve the problems. Leadership· Establishing direction: developing a vision for the future and strategies for producing the changes needed to achieve that vision. · Aligning people: communicating direction in word and deed to all whose co-operation is needed to influence the creation of teams that understand the vision and strategy and accept their validity. · Motivating & inspiring: energising people to overcome major political, bureaucratic, and resource barriers to change by satisfying basic, but often unfulfilled, human needs. Produces a degree of predictability and order and has the potential to consistently produce the short term results expected by various stakeholders. Produces change, often dramatic, and has the potential to produce extremely useful change eg new products that customers want, new approaches to labour relations that help make a firm more competitive. While the existence of good managers is important and necessary in any organisation, the need for leadership is imperative in any change effort. The need to focus on your Vision Change is Vision-driven, and the desire of human beings to change is vision-driven. Therefore be prepared to spend substantial amounts of time in drafting and detailing your vision for the new organisation. You and the guiding coalition must be able to explain the vision at the drop of a hat, to draw examples and analogies from day-to-day circumstances as to why a situation does or does not follow the path of the vision. Uphold your core values People and organisations have many values that they act on; thou shalt not steal, the customer comes first. However core values are those values which the organisation would never betray. In fact, core values are those that, given the choice, the organisation would rather close down (and people would rather resign) than to betray. Leadership is all about upholding values. Leaders need to measure their behaviours against the core values, often made explicit by the vision or vision statement, and to walk the talk. Leaders need to explain why behaviours are no longer tolerated while other behaviours are rewarded, starting with their own behaviours. Use people’s strengths Leaders looking to create a resilient organisation need to use the strengths they have in their people; they need to make resilient people. This means that you need to analyse your team’s strengths and weaknesses as employees and in their functional roles. Training takes a large position on this stage, in order to provide people with soft as well as hard skills. You will need to look at your HR practices to see if these portray a culture that matches the change vision – are people viewed as assets or commodities? Does the organisation engage its workers or are they merely paid to be present? The challenge today in building a resilient organisation is no different to 20 years ago, although we may apply different tools. The characteristics to develop are still the same, being the ability to face brutal facts, the ability to apply meaning to events and apply core values, and the sense to ritualise innovation. Leaders have to act far more quickly now, than 20 years ago when the pace of change was much slower, and the implications for leadership are immense.